Members of Arunachal students' body visiting construction site in Changlang district of Arunachal Pradesh. Photo by Laxman Sarma. The All Bordumsa Singpho Students Union along with other local socio cultural organizations at Bordumsa in Changlang District of Arunachal Pradesh alleged fraudulent methods used by the construction company while carrying out the carpeting work of Arunachal Trans Highway development linking Gidding (Bordumsa) to Mahadevpur stretching about 25 kilometers. One of the Singpho leaders said,’The local youths along with other social activists of Bordumsa village during their visit to the site on Sunday morning at Gidding noticed the alleged substandard construction works of the road and immediately brought it to the notice of the PMO, Arunachal chief minister Pema Khandu, union minister of state for home Kiren Rijiju and union minister of road transport and highways Nitin Gadkari through various social media. However repudiating the allegations as baseless that too by a section of people without technical knowledge on road specifications, the site in charge told the North East Now that it was the initial layer laid couple of days ago and more works are yet to be accomplished in its successive stages. According to him, quality and nature of works are determined by the assigned work specifications. He also asserted that a central vigilance team had visited the entire construction site recently and expressed satisfaction on the progress of construction works of the road. On the other hand, the aggrieved organisations too have been reported to guard off their loins to ensure that the public works being in progress in the entire belt are carried at per assigned specifications to ensure quality output. 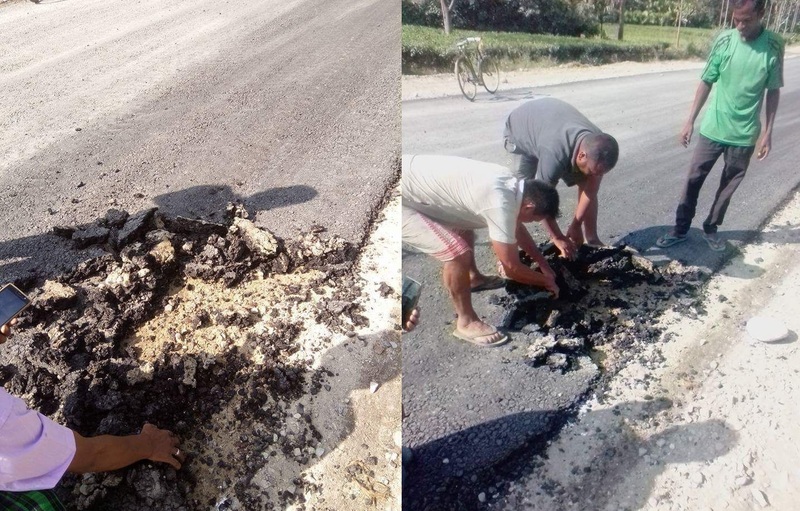 Huge man -holes along the roads due to digging beyond specifications, lack of water sprinkles causing dust pollution and erection of side bumps also have been the potential grounds that raised the eye brows of the local residents.